The following case represents a 20 year old male with a known high cervical transverse lesion after an accident which left him wheelchair bound. He presented with a pneumonia which was complicated with a purulent pleuritis and a purulent pericarditis. He was treated with broad spectrum antibiotics. 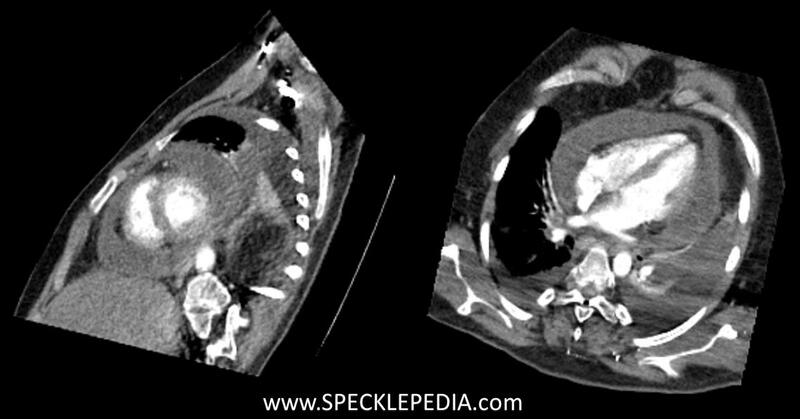 The pericardial exudate (empyema) was not evacuated due to the clinical improvement upon treatment and the high associated operative risk in this patient. After antibiotic treatment he was free of infection (and remained so afterwards) with resolution of the pleural and pericardial fluid. Follow up examinations have been favorable: he is free of any complaints and there a no clinical symptoms of a pericarditis and no signs of a constrictive pericarditis at physical examination. 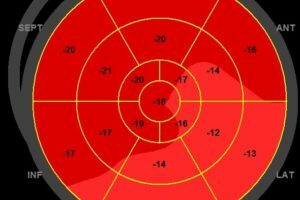 Even though the ultrasound fits with constrictive physiology, the heart team advised a conservative treatment. Conventional ultrasound at presentation showed large amounts of pleura effusion. In addition there is a significant amount of compartmentalized pericardial effusion, which most likely is purulent effusion / empyema. A still image is provided below. A CT scan (made prior to the ultrasound by the pulmonologist) shows a large collection of pericardial fluid surrounding the entire heart. 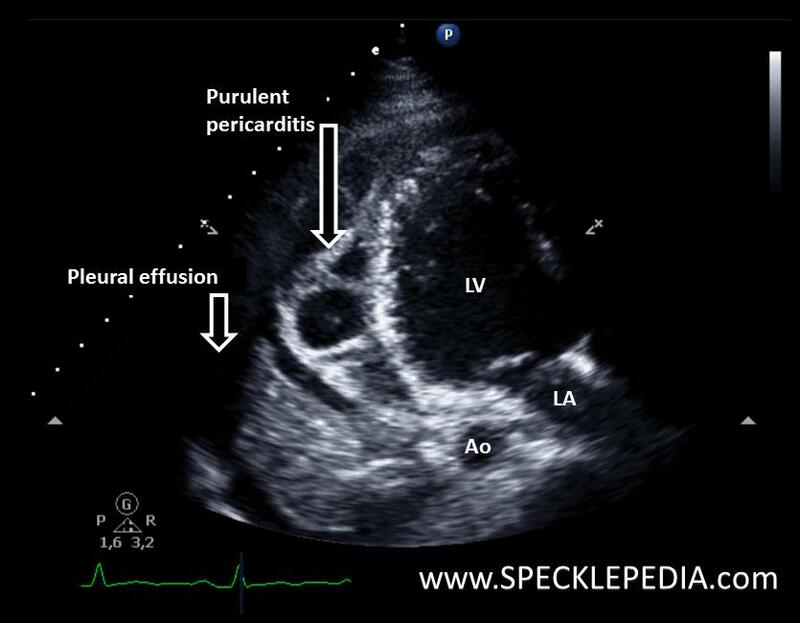 There still is a significant amount of pleura effusion seen, while the pericardial effusion has completely resolved. 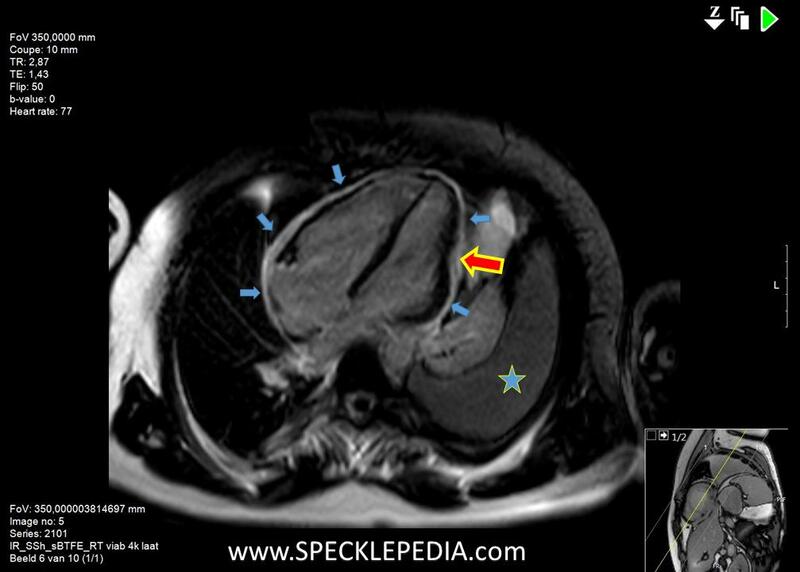 Upon closer inspection, it is clear that the pericardium is thickened around the entire heart. In the short axis view this thickening of the pericardium is also appreciated. Also not the “septal bounce” in the second cardiac cycle. In the apical views we confirm the absence of pericardial effusion with the exception of a localized pocket behind the RA. The lateral and posterior wall appear hypokinetic. The left ventricular ejection fraction is preserved; 56% on 3D echo. 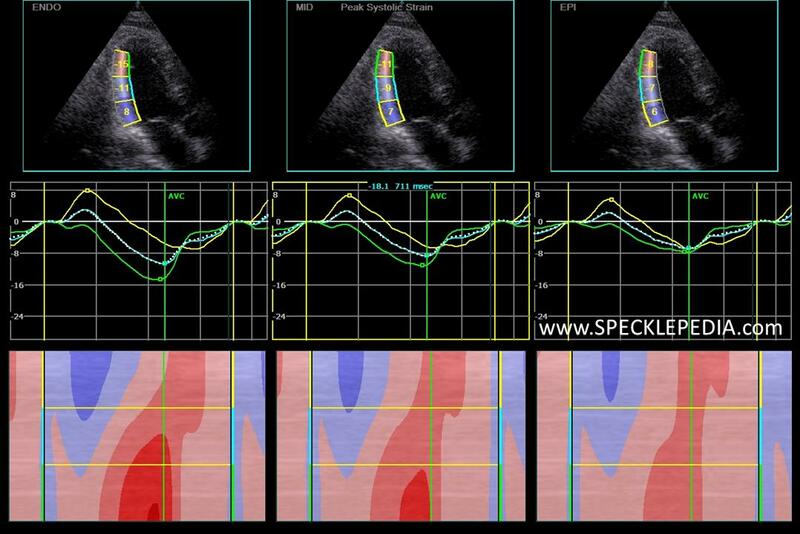 Doppler interrogation of both the mitral and tricuspid valve show significant variations with respect to in/expiration, fitting the Mayo Clinic criteria for constrictive pericarditis. Finally, the hepatic vein pulsed Wave Doppler recording shows end diastolic flow reversal (indicated by orange arrow), a typical finding in this disorder. Deformation analyses reveals a markedly reduced global longitudinal strain of only -12.6% despite the preserved LVEF. 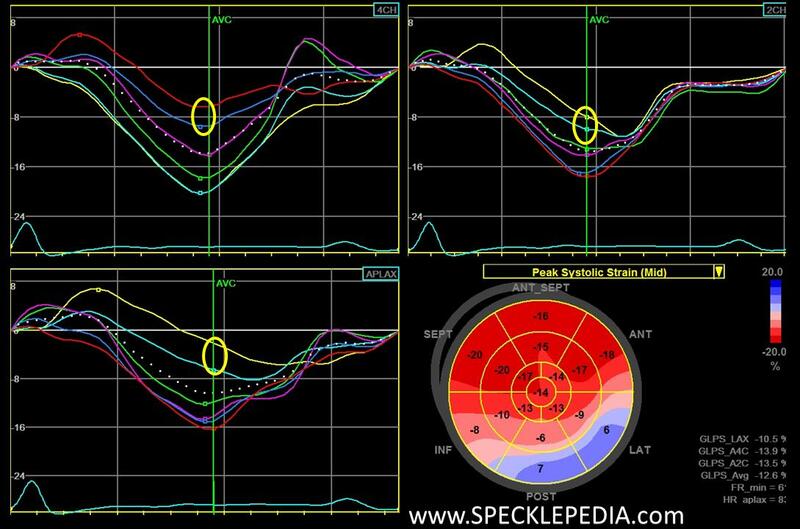 There a clear regional abnormalities seen which are highlighted with the yellow circles in the figure below. 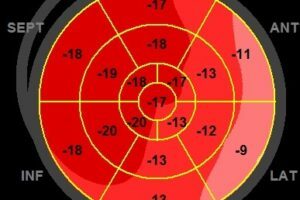 The basal en mid segment of the inferior, posterior and lateral wall show a reduced peak systolic strain. These segments are those directly adjacent to the pericardium ans reflects the adhesion of the pericardium to the myocardium, in turn restricting the longitudinal movement during systole. The segments that are not in contact to the pericardium (i.e. 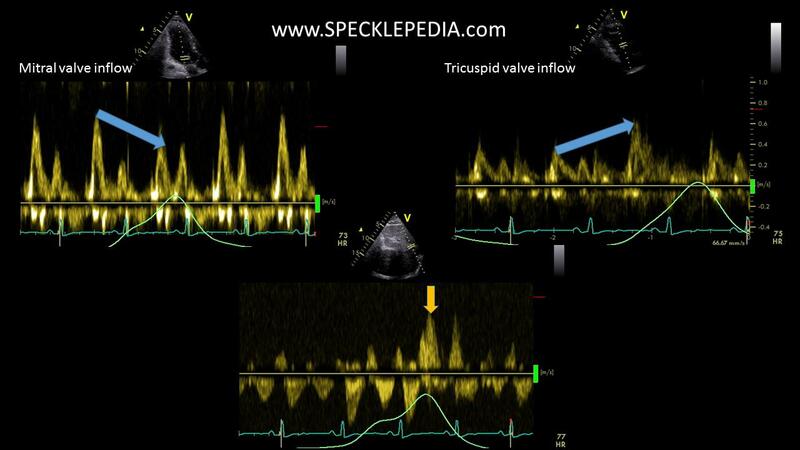 the septal wall) are unaffected since the myocardium is unaffected in this disease process. The apical long axis vies (or 3-chamber view) in this patient. 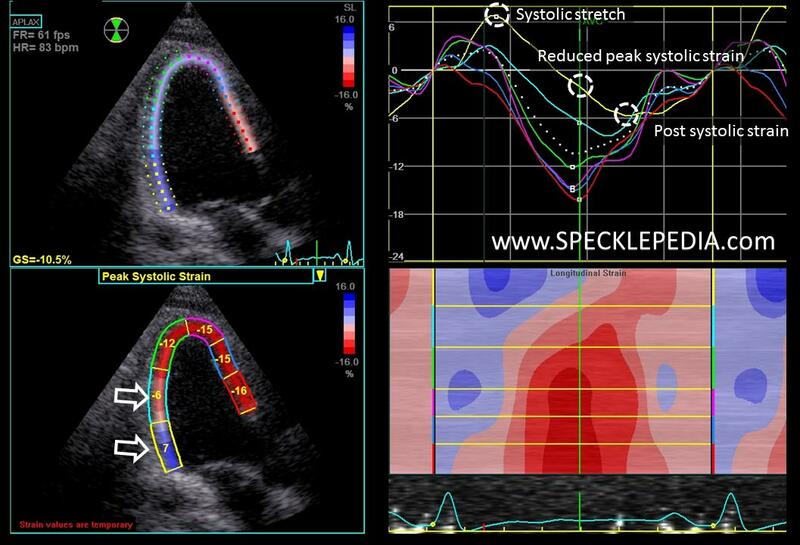 Note the abnormal deformation properties in the posterior wall with prestrech, a reduced systolic strain, and some post systolic shortening. The anteroseptal wall shows a normal deformation values and a normal deformation pattern. The two figures below show the regional deformation in the septal wall and the posterior wall, respectively. From left to right the deformation from the endocardium to the epicardium is shown. Note the normal deformation pattern in the septum with a gradient of strain values of only a few percent (normal variation). The posterior wall shows abnormal deformation properties as explained above. Furthermore, it is clear that there is a gradient towards the epicardium (in other words, reduced longitudinal strain in the epicardium compared to the endocardium) due to the adhesion of the pericardium at that location. This is a typical finding in this disorder. Cardiac magnetic resonance imaging shows no pericardial fluid and a large amount of pleura effusion (indicated by the star). The pericardium is thickened (8mm) around the entire heart (indicated by the blue arrowheads). In the lateral, posterior, and inferior wall there is adhesion of the pericardium to the myocardium (shown by the red arrow). 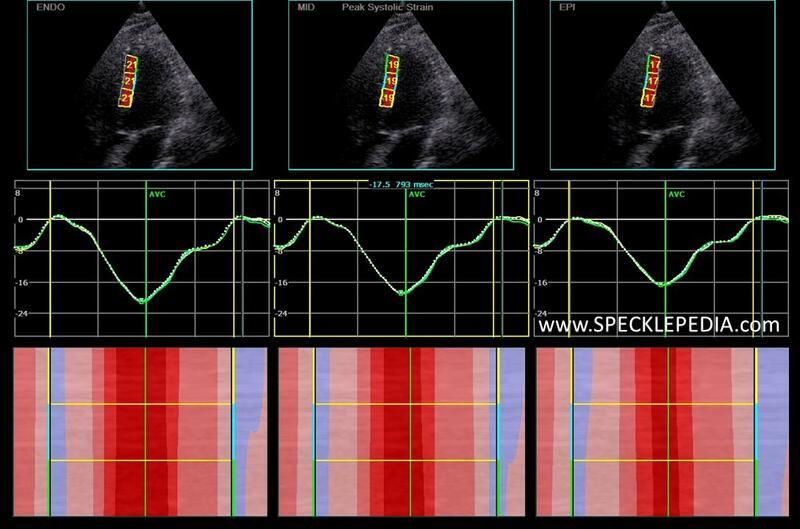 There is no delayed enhancement seen in the myocardium.